They’ve been the main flagships of their own teams in this World Cup and no one will carry more pressure on their shoulders this Friday evening than Neymar and James Rodríguez. Brazil and Colombia will lock horns in Fortaleza to decide who goes through into the semi-finals and on the field, it might very well come down to who shines the most between these two prodigious players. It’s also important to note that no matter what happens in this game, we’ll keep delivering all the latest news about the World Cup, always with a special focus set on Neymar and Brazil. This will continue happening right until the tournament ends, regardless of how far Neymar and the hosts end up going in the competition. Roughly 24 hour away from this clash, we decided this would be a good time to look into some of the numbers and stats that both Neymar and James Rodríguez have been delivering thus far. Just to kick things off, let’s start by highlighting that the Colombian star is currently the competition’s top scorer with 5 goal, being immediately followed by Neymar with 4, as well as several other players who have the same amount of goals as the Brazilian forward. Until the upcoming quarter-finals, Colombia has been extremely fortunate to be able to rely on James Rodríguez‘s goal-scoring vein. The AS Monaco attacking midfielder has scored in all the 4 matches he played in this World Cup, with the particularity of netting a brace in the last game against Uruguay, already in the last-16 knockout stages. His contribution has been vital and the Colombian fans will certainly keep expecting a lot from him tomorrow night. 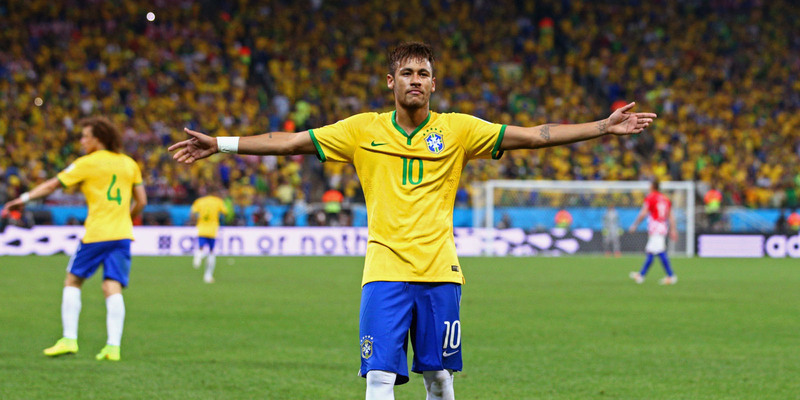 On a similar situation, Neymar has also been leading his home nation to several victories in this tournament. However and unlike James, the Brazilian star didn’t score in every match played so far, since the 4 goals he netted so far are the result of two braces against Croatia in the opening game and against Cameroon in the last fixture of Group A. As surprising as it may sound, Neymar is yet to provide a direct assist to any of his teammates in this World Cup. He scored half of Brazil‘s goals so far (4 out of 8), but he still didn’t find the right openings to set any of his teammates up with clear-cut goal-scoring opportunities. On the other hand, James Rodríguez already has 2 assists on his personal count, which is actually not that surprising since that’s the parameter of the game where he tends to excel the most. If we look at the exact amount of times that each of these two players have tried to score in what has been played so far in this tournament, we get to see that none of them is exactly shy when it comes to go for goal. Even though Neymar has accumulated more playing time than James Rodríguez in those 4 games held so far (369 minutes vs 309 minutes), they’re both totaling the same amount of shots throughout those matches. The brighter side here, at least from a Brazilian perspective, is that Neymar seems to be hitting the target more often than James Rodríguez (9 shots on target against 7 from the Colombian number 10). Not that it does matter much since the AS Monaco midfielder has managed to find the back of the net more than anyone else in this tournament.